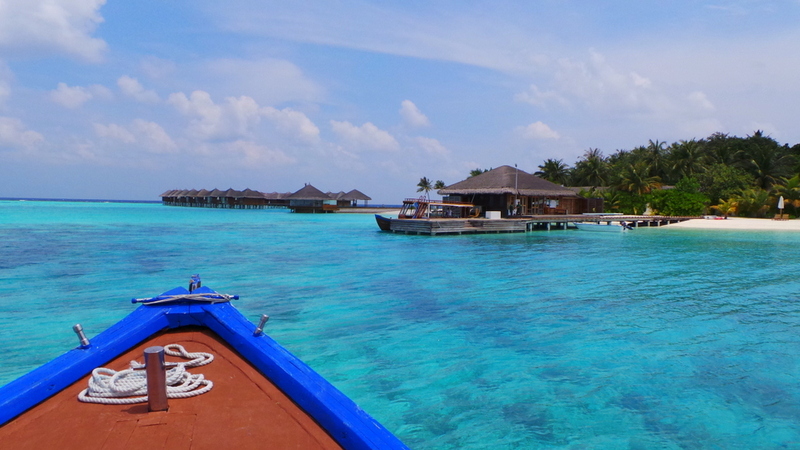 Your experience in the Maldives is very dependent on the resort you stay at. So if you ask me, “which resort should I stay at in the Maldives?” I will need to know your travel personality first. There are over a hundred resorts in the Maldives. Each of them varying in rating, price, theme, and overall resort ‘character’. 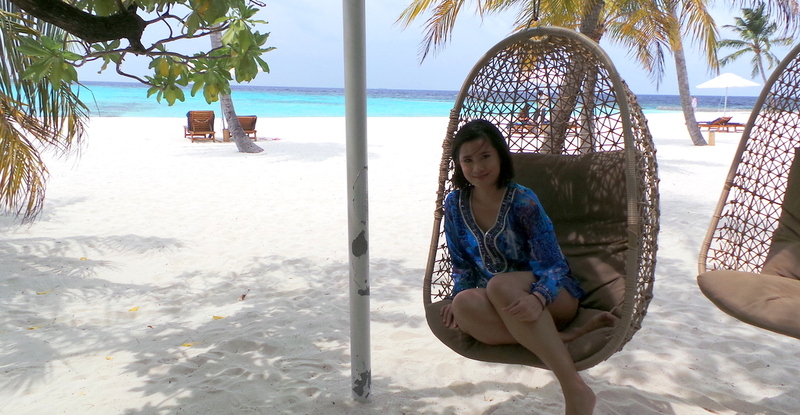 To kick off our 2-week stay in the Maldives, Zombie and I eased in to the chillaxed mode slowly. 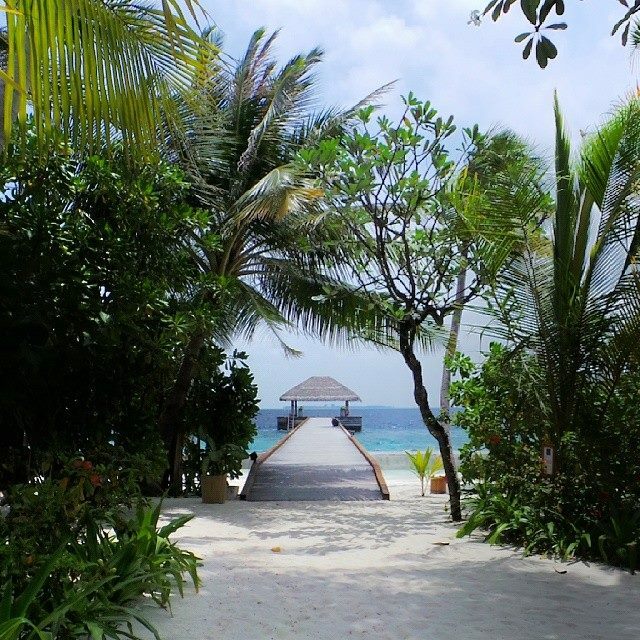 We stayed at Maafushivaru Maldives, a resort that offers barefoot and no-fuss luxury. We did feel pampered, all right. But we were also given a lot of space which makes this resort ideal for those who do love to indulge, but are overall independent resort guests. 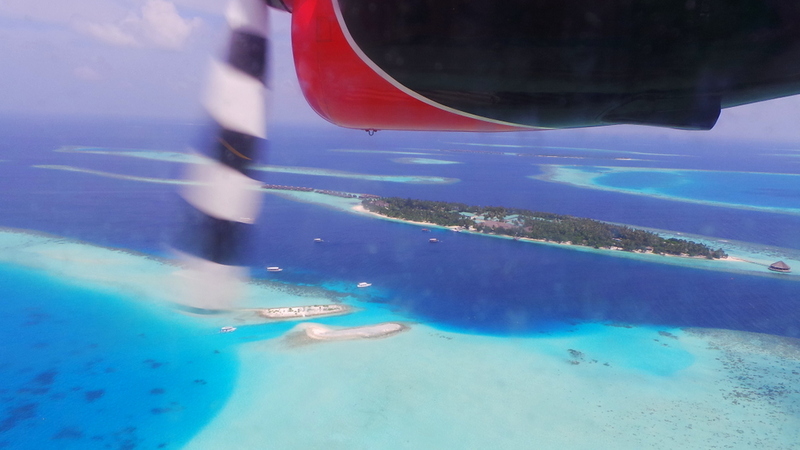 From Male Airport (Capital of Maldives), we took a seaplane flight. It was a short 25-minute flight. We were dropped off ‘in the middle of the sea’ — well, this is putting it quite dramatically. Yes, somewhere in the ocean indeed, but on a pontoon. We were given cold towels and quite a refreshing drink. Though abit too sweet for me, we welcomed it with appreciation and gusto as a cool drink is just what you need in the middle of a perfectly hot day. Immediately, we could see at this point that management was very visible. Resort manager Ronald Schweighardt, and Assistant Manager Marie Dooley were personally either welcoming new guests, or attending to queries of existing guests at the reception. Check in was done at the sand-floored open reception. Though it was abit early for standard check-in time (this was around 11AM), we were told that our Water Villa was ready. 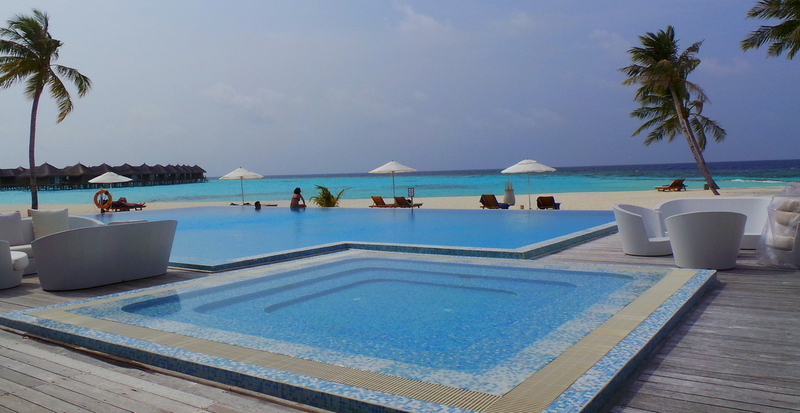 Maafushivaru has 3 Villa types: Beach, Pool, and Water. The water villas (or overwater bungalow) are located at the end of the island. The moment the door was opened for us, I immediately felt fresh wind, the sound of lapping waves, lots of natural light in the room, and of course, that endless stretch of turquoise. It was really, really hard not to be mesmerised by the turquoise waters. Waking up to this each morning was pure joy. As early as 6:30AM, the azure waters first whisper to you by the sound of waves and the fresh seabreeze (we sleep with windows open). And with eyes half open, you gaze into this magnificent blue- that’s been my 2-step process into jumping out of bed. I loved that the room is mainly white, with lots of natural wood–giving a lot of breezy atmosphere. I really love how natural light comes into the shower. 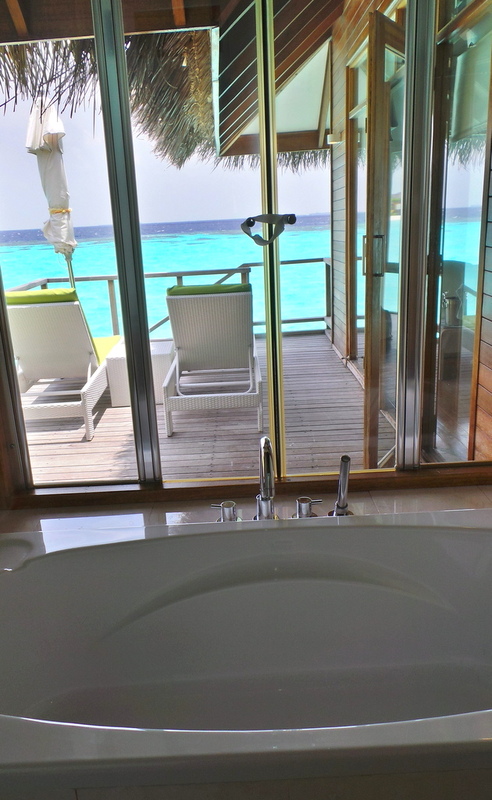 It’s not a completely outdoor shower feature (as is popular among water villas in the Maldives), but this is a good middle-ground to those who are still not that uninhibited enough to take a shower under the open skies. All toiletries are from L’occitane Verbena line, which made Zombie, well- a really really happy Zombie. 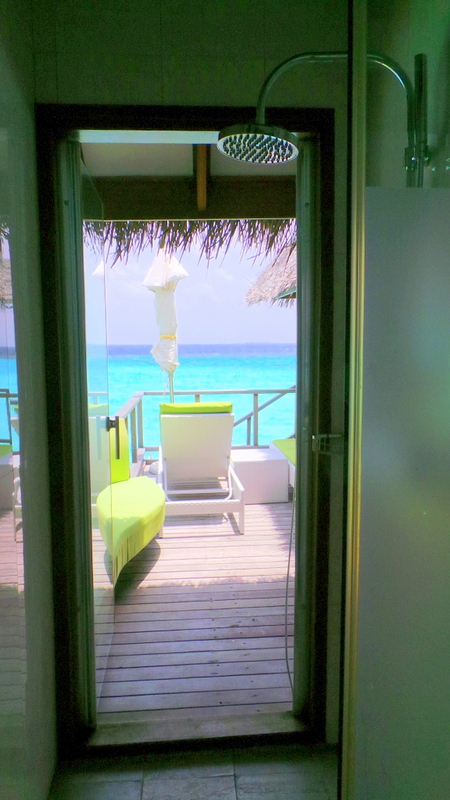 As all resorts in the Maldives are in their own island, rates normally come in either full or half-board packages. Ala Carte is also available, but most have their meals buffet-style at the Cuisine Gallery (above). We had all our meals here. 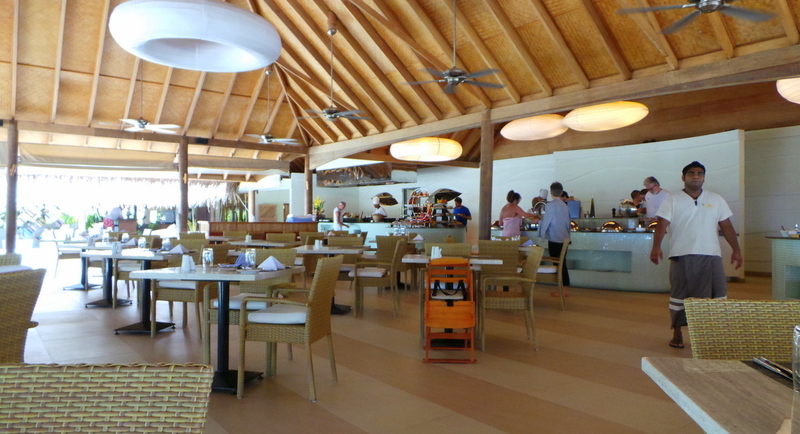 The dining area keeps to the overall design of the resort and rooms – airy and lots of natural light and wood. 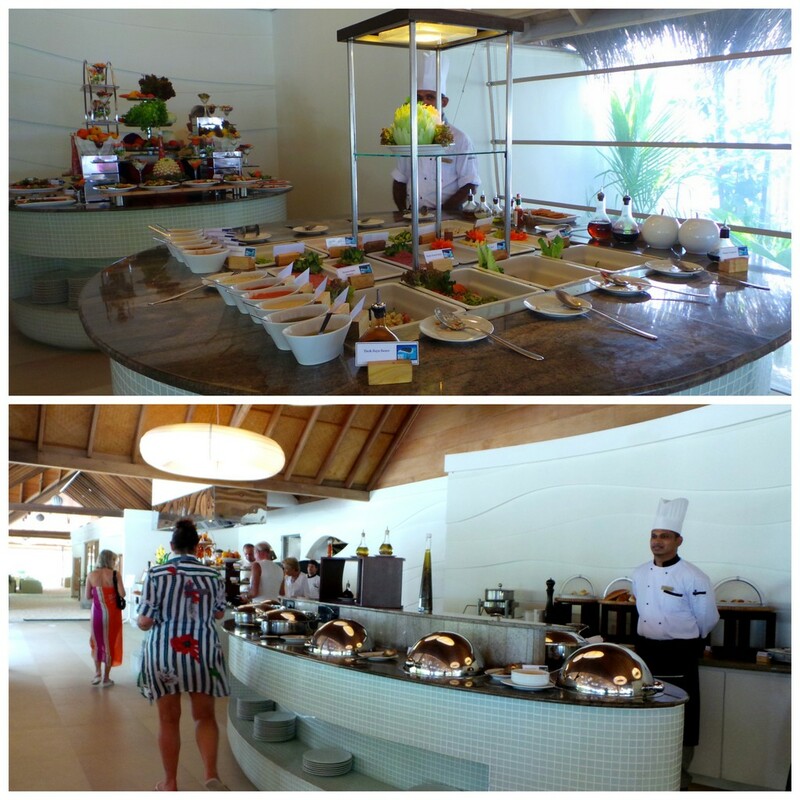 The buffet selection, I’m pleased to say, offers LOTS of vegetable dishes. I don’t think vegetarians need to request special meals. I was really impressed with the various ways they served vegetables – roasted, fresh, stir fried, baked – you name it. Salad station, entrees, mains, desserts- all were served in separate stations. I have to say that I enjoyed the vegetable dishes much more than the meat based ones. 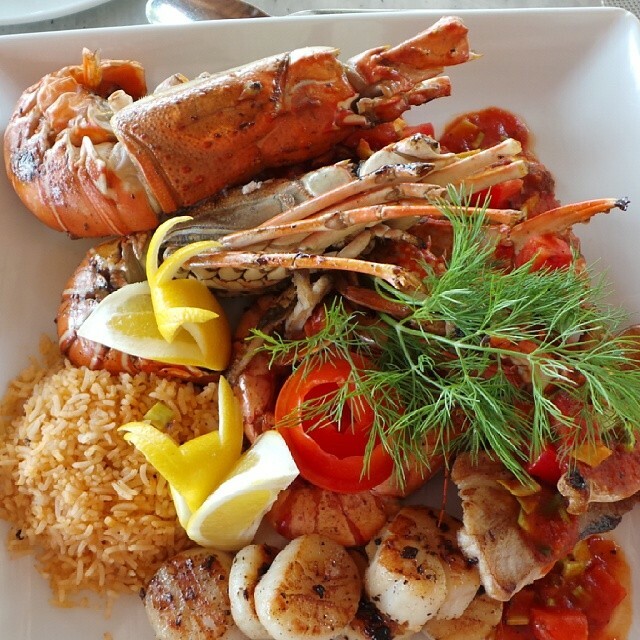 My tip would be to order (separate from the half or full-board plan) the seafood platter. This platter was really fresh and so good that we had it twice! I loved that they kept the flavouring simple (tomato and pepper based) so it wasn’t too heavy. 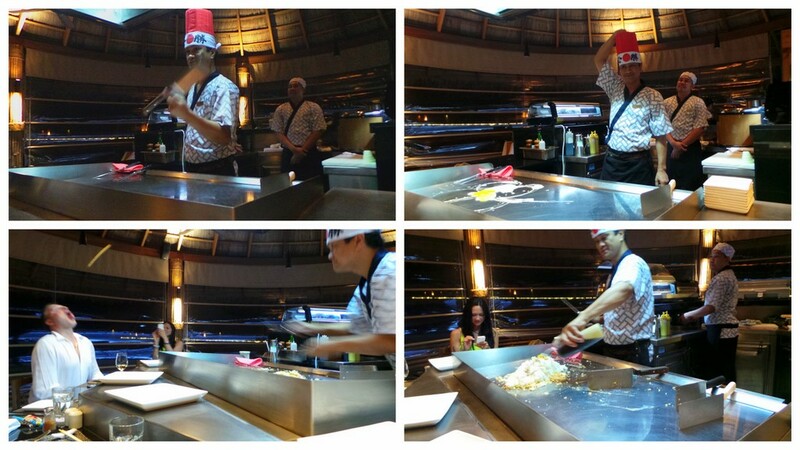 Though we had most meals at the Cuisine Gallery, we also had dinner on our last evening at 135 East, a contemporary Teppanyaki and Sushi restaurant, located in its own pavillion in the island. There’s a very breezy and tranquil aura in Maafushivaru. When we arrived, I was still kind of nursing jet lag from our late arrival into Male the night before, and I immediately snapped out of my jet lag when I saw the scene above as we were making our way to reception. The occupancy of the resort at this period was almost full, yet it was hardly felt. They hold movie nights every week in this venue. This is also where a band plays during the night. 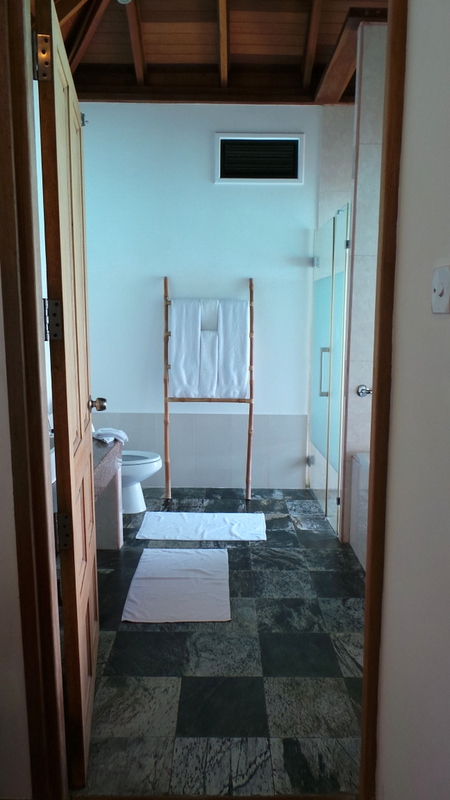 There are many ways to relax independently in Maafushivaru. 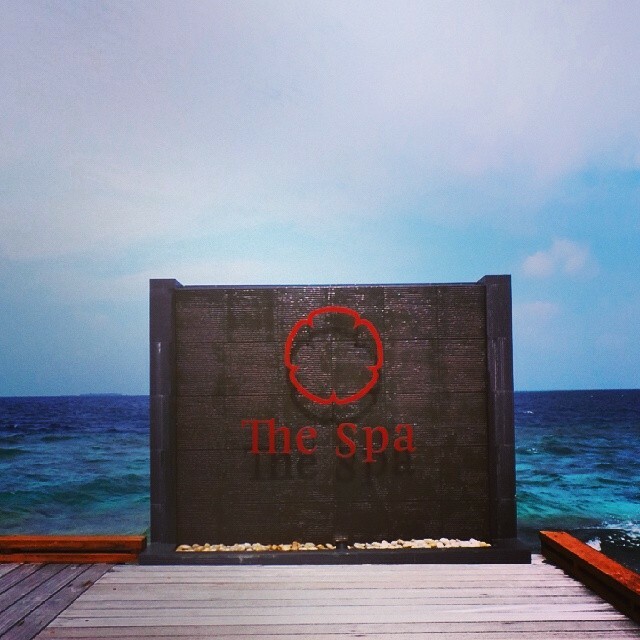 If all the atmosphere wasn’t enough to make you feel relaxed, The Spa at Maafushivaru offers wellness treatments in a quiet corner of the island. 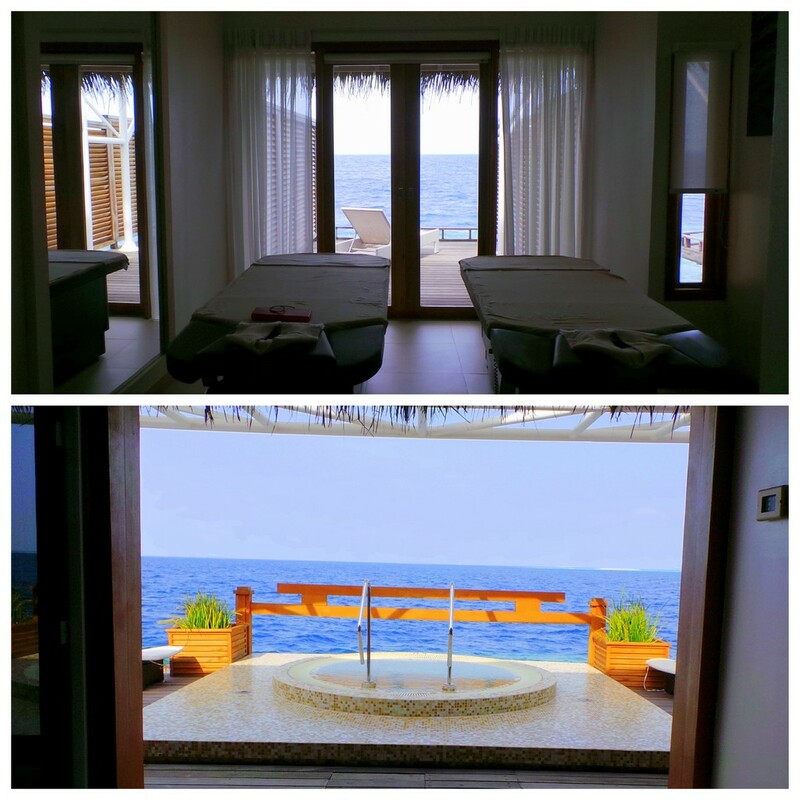 I had their signature relaxing massage, ( too much relaxation has never harmed anyone, now) and their treatment rooms were all overlooking the water. After the massage, I chanced upon their outdoor spa/jacuzzi area and it does look very zen. I debated whether I should hop in or meet Zombie back in the room (who snorkelled while I was spa-laxing) and decided to head back to the room. I just knew I would not want to heave myself out of that jacuzzi if I had a dip! 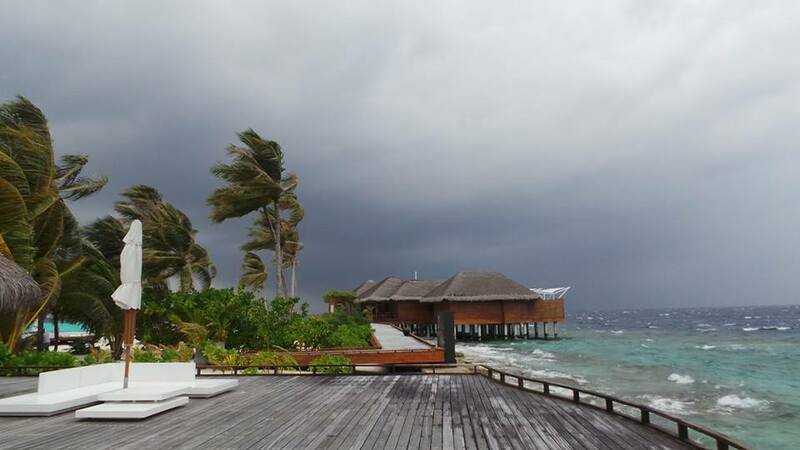 What’s underneath my water villa? Well now, here’s where Zombie aka The Happy Snapper takes the helm. 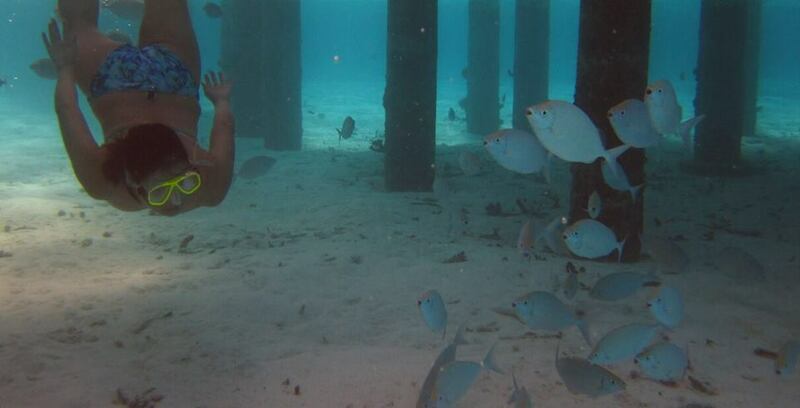 Here’s a clip of what the house reef of Maafushivaru is like. 2.) Well done to the Management (husband and wife team Ronald Schweighardt and Marie Dooley). Despite running the resort for less than 6 months (as of March 2014), they have kept the resort in overall top-notch condition. They are also very visible throughout the resort and can be seen liaising with guests daily. 3.) The unhurried and laid back atmosphere. Unlike bigger resorts, they do not have a rigid ‘schedule of the week’ kind of roster that suggests things like “0930: join a session of yoga zen at the gym/ 11:00: kids class” etc. 4.) The water villa itself. Loving the L-shaped window panel that allows you to have a view of the water anywhere you are in the room. 5.) The staff offered warm and genuine service. From pre-arrival emails up until we were brought to a seaplane on departure, the sincerity of the staff can be felt. And as with all resort love affairs, there are always things that we think can be improved for better experience. 2.) Food was not bad at all but it wasn’t the highlight of the stay. Having said that, we would still personally return to Maafushivaru and recommend it to: couples, honeymooners, families with grown children. Maybe first love never dies, but as our first resort in the Maldives, Maafushivaru has a soft spot in our warm and sunshine-y memories. Perhaps its because we could also identify with the ‘barefoot luxury’ theme that prevailed. We do love to be pampered, that’s for sure. But we appreciated that this was done without any of the staff being obtrusive. My husband and I stayed here a couple of years ago! Perfect place to relax and wind down from work in the winter months. We went to see the whale sharks which was a fantastic experience. The resort was goregous, staff really helpful and friendly & love the sister island! Sounds like you had the most wonderful time Charlotte! 🙂 Yes we did the whale shark and lonubo island too, it was marvelous. It’s the antithesis of work and winger– Maafushivaru. Hi Ann, yes they should make a song about this, if there is a “Caribbean Blue” there should be 1 about the Indian ocean blue! What wonderful place! I will at that to my bucket list. Your photos and video are so clean and crisp, I’m envious. Thank you Shawn! Believe me, Maldives is in our bucket list..again! 😉 a really happy, wonderful place. I am a huge fan of it- Bell thinks it’s more of a guy thing 😉 Beautiful job documenting this, as usual!! Yes their seafood is wonderful! Wow, loved reading this! We are off to Maafushivaru in just over 4 weeks for our honeymoon and I really can’t wait now!! Can you tell me if they provide towels etc? I’m assuming they provide toiletries in the beach villas too…trying to work out what to pack and what I really don’t need!! woooooow that looks sooo good! your blog overall is amazing looking forward to reading the rest. I cant wait for you to do a piece on Greece, especially these two islands Mykonos and Santorini ..You will definatley love them! oh and you have the best job in the world!! sorry i meant Mykonos and Santorini. Absolutely stunning Jean, this truly must be paradise on earth. Such amazing scenery and a great accommodation spot no matter what the price. I hope I can afford to visit some day. I also didn’t realise there were so many islands to the Maldives. As a little side note, I’m reading this from my netbook so I have a smaller screen than laptops. This social share toolbar on the left hand side is blocking a lot of the text I’m trying to read. I effectively can only read text in the bottom fifth of the screen. Would moving the social share toolbar to the right be an option? You can remove this last paragraph when you publish the comment. I just wanted to share my experience. I love the review though. Thanks again for the feedback I really appreciate it! Lovely write-up. I am sitting in the Library Lounge in Maafushivaru right now writing this. You’re right, it’s an absolutely gorgeous island, and with this being our fifth visit to the Maldives I must say that Maafushivaru tops the list in almost every way. The resort is undergoing a change of management right now but fans of the resort need have no worries because they are keeping it much the same with the quiet luxury and unobtrusive attention to detail. A nice touch was that the island Manager Ron took us on a tour of the island’s “inner workings” which really brings home the significant work that goes on behind the scenes to make every guest’s stay such a wonderful experience ans to keep the resort running smoothly. 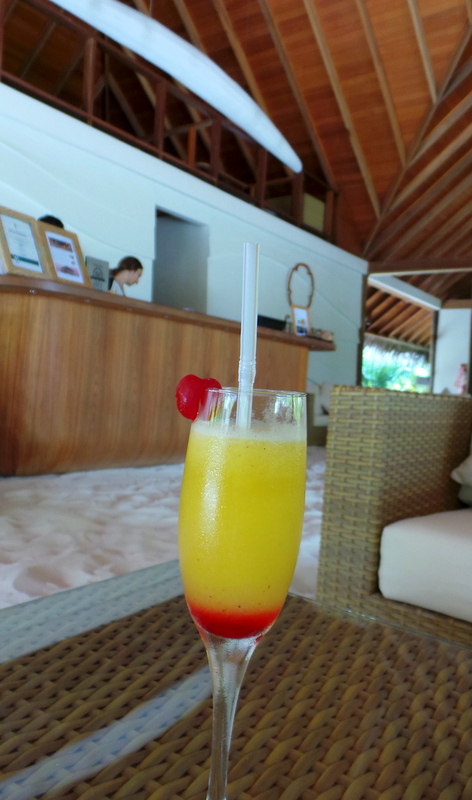 It also helps you relate to the Maldives much more and appreciate everything the resort does for you. Did you know for example that the sun-loungers are made by the island’s carpenter and it takes him just 3 days to make one!